Holy Toledo Batman!!! Where has the time gone? It’s been quite a while since we’ve given some love to the blog. Summer is just a super busy time it seems. But then again, so is the wintertime with all of the holidays. Butta and I took some time away for some fun vacations, have had our heads in a few different projects, busy with RL work, as well as discovering a new online game to play together. We’ve started playing No Man’s Sky. It’s tons of fun if you enjoy being an explorer, discover new plants and animals, and like being in outer space. Check it out if that sounds like you and hit one of us up! We’d love to do a co-op game with some peeps. So let me tell you a little bit about Sandy’s creations, shall I? Sandy would describe her style as boho chic. She loves loves bold, bright, colors. And that’s what you will find in her designs. Her clothing is not for ladies that prefer muted, neutral colors or patterns. She definitely has an eye for putting bright solid colors with bold patterns, that initially you might think…”naw, that won’t work together”. But Sandy puts them together and they just work beautifully. She does an amazing job with her textures and attention to the details. I’m so excited to see her creations and support her. Please check her store out, you won’t be disappointed. So about the dress that I’m wearing…as you saw above, it’s called the Kokomo Beach Dress. The dress comes in sizes for Belleza Freya, Isis & Venus, Maitreya Lara, Slink Hourglass & Physique. The dress is floor length. Just the tips of my toes peek out under it when wearing my high feet. As all long dresses do in SL, my legs will poke out from the dress with walking or AO movements, so I suggest alphaing out most/all of your legs if this bugs you. The dress has a solid color middle section to it that has tiny little eyelet holes cut out of the material, giving you a little bit of peek-a-boo, which I think is a nice touch to the dress. The sleeves are separate from the dress, which I love. Many times, when you have tops or dresses that have these off the shoulder sleeves that are attached, there’s this very weird…string that attaches them. This ads to “realism” I suppose, but makes for a really awkward look when your arms move or are raised up, stretching that string like a rubber band. You won’t have that issue with these! The sleeves are not removable, which would have been a nice addition to the customization of the dress. But she does have 2 texture options for the sleeves. They can match the pattern of the dress, or they can be a solid color (as I have done in my picture above). The dress has really well done materials on it as you can notice in the picture as well. There are some really gorgeous texture options on the HUD, so there’s bound to be something for everyone (as long as you love color!). I love the dress and the fit is really great on my Maitreya body. At the current round of Blush, Foxcity has some really nice new poses for photography lovers. The poses can be bought separately, but the fatpack includes an exclusive 7th pose, as well as the sarong and mesh sand. So if you want these, you’ll have to purchase the fatpack. 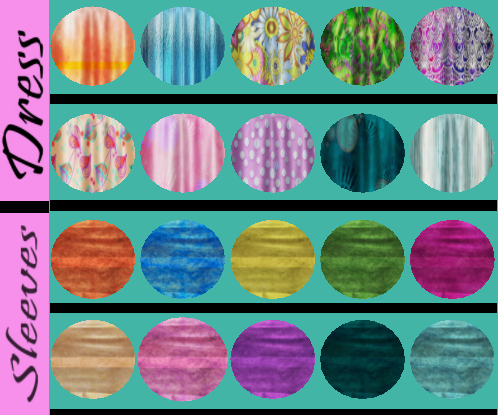 The sarong has 10 texture options and 4 transparency levels. A definite must have pose set for beach lovers! S. Schnook here. Excellent work as always my dear friend! I am looking forward to see what else you do. Big hugs!